The centric ring is a device used with the rims and are installed between the car wheel hub and the rim. The purpose of the hub centric ring is to fill the empty space between the wheel hub and the center bore of the rim. 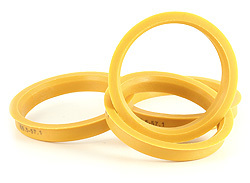 Centric rings are usually made of durable industrial plastic. Centric rings are also made of aluminum. What are centric rings needed for? Centric rings are needed when the hub hole (the center bore) on the rim is larger than the wheel hub of the car. The rim manufacturers deliberately make the hub ring as large as possible for the rim, taking in to consideration the hub hole, to allow the same rims to be sold for the various different models of car using hub centric rings. Centric rings are usually needed only for post-sale rims, since the original rims usually come with a center bore of the right size. Usually the hub centric rings are used with alloy wheels, but sometimes steel rims may need hub centric rings. The purpose of the centric ring is to perfectly center the alloy wheel to the wheel hub and hence prevent vibration to the steering wheel during driving and the shaking which typically appears around speeds of 40-60 mph. Do you live in the USA? This site is for customers living outside the USA. We have a separate online store and stock in Michigan - if you live in the USA, please go to https://us.hubcentric-rings.com to get your rings way faster! Thank you!